My four years old bought a new pair of sports shoe two nights ago and had been wearing them around the house. He insisted that I take a photo and blog it. I thought of bluffing him that I had done so but apparently, the son of a blogger is not easily bluffed. He knows how to google 5xmom or use the browser address and check! 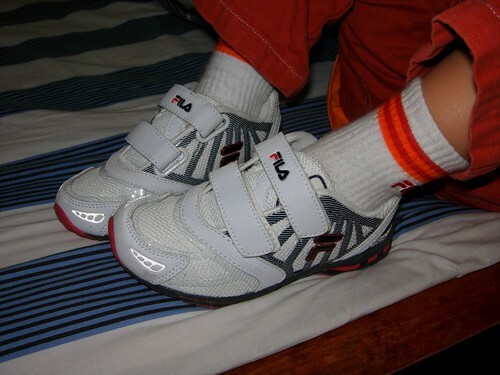 He will mumble to himself, “Mommy say cannot click on Adsense.” He found out that I haven’t blogged about his shoes. So, this post is ordered by my toddler. And no, it is not sponsored by FILA. And yes, comments please so I can read it out for him. You know, he can type a few words like love, car, cook, eat and a few other basic words. One day, he typed love on my MSN which will cause a red heart to appear. He knows how to type his name and the love heart and his papa to MSN him every day. But only problem is, he did not send the heart to his papa. Ammah, he was using my MSN nickname and he MSN to some random stranger! OMG, mana mau lari? And yes, he knows which ‘auntie’ is MSN-ing with me. Heh! By LilianIn Family20 Comments on Mommy, blog my shoes! Next Next post: Malaysian Censorship Board – Why Evan Almighty rated 18PL? Kids are so clever now a days!! Nice shoes boy… love it. Looks like it fits you nicely huh? Did you made the choice yourself or mummy helped you? wahh! pandai hor u! ur mother cheat u hor. very bad very bad! nice shoes, very clean! can uncle wuching step on it to christen it please? Ya, Matt good boy hoh, MSN with Aunty Samm. Ask mommy bring you down to Ipoh, Here got many 8phor aunty wanna pinch your chubby cheeks. And give you present too. Want???? Then faster go bug mommy…. tell her it’s school holidays…. Tell mummy you want a laptop too. LOL. so cleverrrr!!!! wished i could do that to my mom when i was a kid. Your shoes are very nice. Wahh…nice shoes. Matching socks sommo. It must have cost mommy & daddy a lot of money to buy it. Take good care of it, ok.
Wow. Your kid’s realld smart. So what did you do after you found out about him sending the message? Wah, pants orange, socks orange, shoe also orange colour. Nice combination leh. Nice shoes, luckily I’m not the aunty. LOL! Amboii! Nice shoes! And a clever fellow! How come you’ve got MSN of random strangers on your list? Hmmm….